Everyone, no matter where in the world they are from, desires to experience community. Coming to a place far from home as an international student, it is especially important for you to find community. Camaraderie with fellow resident members and connection opportunities in the Greater Lafayette community and beyond are benefits of calling Crosswalk Commons your home. The Crosswalk Commons team is a committed group of friendly and cross-culturally experienced people who are ready to engage with you as a resident member according to your schedule and need. Ready to assist in those hard-to-categorize issues that arise in the life of an international student, we look forward to welcoming you to your new home! Fun social activities in the Greater Lafayette community: hayrides, Chinese Lantern Festival, horseback riding, corn maze. A free Bike Loan program from SLCF International is just one of many services offered to our International residents at Crosswalk Commons. 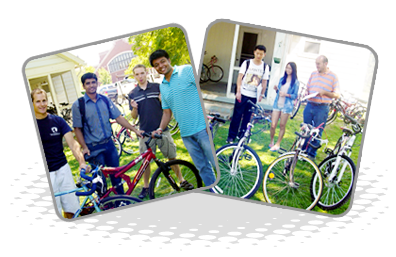 Bikes require a modest deposit, a lock (available from SLCF), and a loan agreement, then the student can use the bicycle for as long as they desire while at Purdue. This is just one of the many services offered by the friendly staff at Crosswalk Commons. If you have any questions, please contact bikes@slcfworld.com. "Daily immersion in the American culture [because of my living opportunity] enables me to grow in adaptability, understanding, and maturity in so many different ways. Besides language acquisition on a daily basis which, I believe, is desired by many international students, I have been greatly exposed to authentic cultural experience including cuisine, American family activities, traditions, values, and so on." "Those were lonely days. I was experiencing many difficulties in my life, and I am thankful for...Salt & Light. The association ...connected [me] to a family far from [my] younger sister and parents. [My association with Salt & Light] was really encouraging.. They helped me with a lot, engaging me in activities, going out to lunch with them, and even taught me about driving on the right side, instead of the left, which I was used to. I felt very much like I was in a collective family." "Because of [your international focused activity], I have a great time in the America. Usually, I want to have experience with American home and American life...Because of [your activity], my dream comes true...."
-A Ph.D. candidate from Korea.